I feel like right now is the ideal time for spring cleaning - according to the calendar spring is just days away, but according to the forecast (31 degrees? really?) it's not time to head to the park for a picnic just yet. So while we're still trapped indoors, why not use this time productively - and get some chores out of the way that we won't want to spend time on once the temperature finally rises. Before you fall asleep, let me remind you that an organized pantry is essential to successful entertaining. By taking the time now to do a quick refresh, you'll be prepared to host an impromptu gathering the first sunny Saturday of the season. And I promise - that day will come. So in the spirit of total honesty, here is a photo of the current state of my pantry - consider this the BEFORE photo. 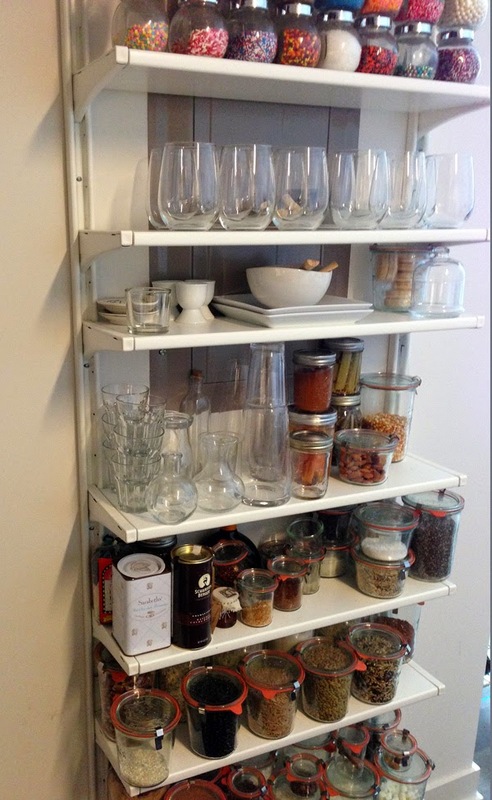 (Due to obvious NYC space constraints, my husband built our "pantry" by installing shelves on a wall of our kitchen. If we ever need to get to the electrical box thingie, we'll have to move my sprinkles first). 1. Remove all containers and clean the shelves. 2. Discard old and/or expired items. The mostly empty jar of mini marshmallows that are probably hard by now will be the first to go. A half of a tiny jar of leftover toasted panko probably isn't necessary either. The same goes for those raspberry shortbread cookies we received in a Harry & David shipment that I keep thinking I'll serve when a friend drops by for tea (when has that ever happened?) Also check to make sure everything is fresh - dried herbs over 1 year old should be replaced. Brown sugar can turn rock hard, so check on that now before you need to use it. 4. Refill essentials. Maldon salt, quinoa, and arborio rice are all running low. Actually while we're preparing for spring, maybe no more arborio rice to tempt me to make cheesy risotto. 5. Move winter items to a less prominent place. Time to say goodbye to Sarabeth's hot cocoa mix. 6. Locate a recipe to use any items that have been on the shelf for a while. Ie: the green lentils bought with healthy intentions. 7. You've earned a reward! Buy a few fun new items that will get you excited for springtime parties, like the Jacobsen Salt Co. Cocktail Salt Collection or Royal Rose Fruit & Florals simple syrups. 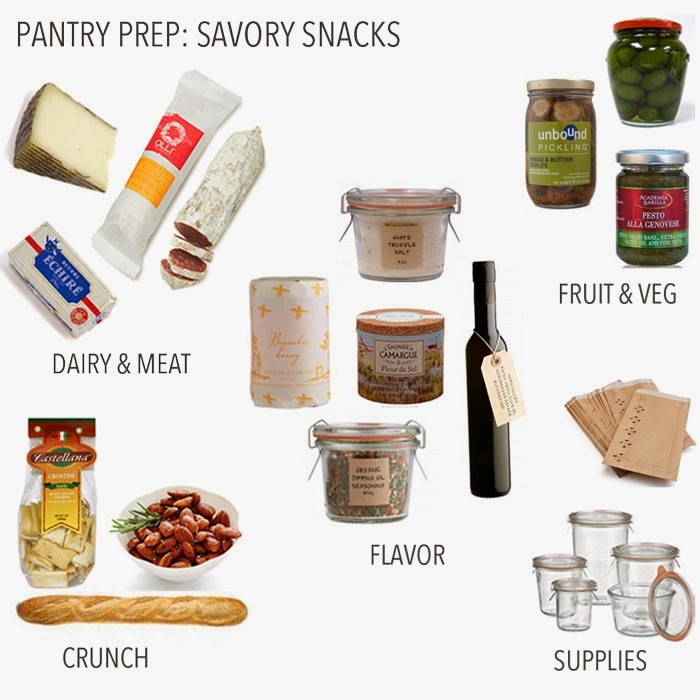 If you need more ideas for preparing your pantry for entertaining, here's a guide I posted last year - click to the original post for sources.